Installing a sub-woofer and amp for a total cost of around AUD$200. By the time you buy a big amplifier and an enclosure, many sub-woofer installations turn out pretty expensive. Some installations also add a huge amount of weight and gobble up heaps of boot space. But not this example! Come with us on a step-by-step Do-It-Yourself sub-woofer install that's very cost effective, relatively lightweight and practical. Before we launch into the how-to, we should first explain the combination of sub-woofer and amp used in our low-cost installation example. 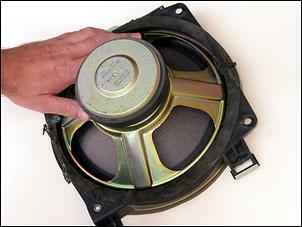 The bass speaker is a second-hand 10-inch sub that was removed from a top-line Lexus SC400. Why would we use such a beast, you ask? Well, in addition to being cheap (we paid AUD$50), the Lexus sub-woofer is designed specifically for 'free-air' use. In a free-air application, the entire boot volume is employed as a speaker enclosure - there's no need to build a dedicated enclosure. This saves time, money and boot space. Like most OE speakers, the Lexus sub-woofer also boasts VERY high efficiency. This is very important as it means you don't need a high-power amplifier to drive the speaker to high listening levels - you can reach the same SPL with a relatively low power input. The upshot is you don't need to shell out for a high-power amplifier. An amplifier is generally required to power a sub-woofer, so in keeping with our budget theme, we purchased a second-hand aftermarket amp for just AUD$90. The Power Acoustik PA-352 amp is rated at 150W x 2 (PMPO) and comes with features that are ideal for powering a sub-woofer - it has an adjustable low-pass crossover, adjustable bass boost, adjustable gain, is bridgeable and 2-ohm stable. 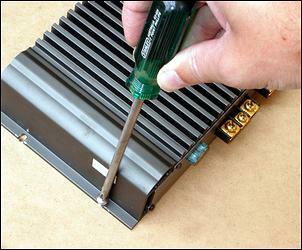 It should be noted that the Lexus SC400 10-inch sub has an impedance of just 2 ohms; unfortunately, the majority of automotive amplifiers cannot be bridged into a single 2-ohm speaker. The only way around this problem - as we have done - is to utilise only one channel of the amplifier (so long as it is 2-ohm stable). In this configuration, one channel is used to drive the speaker and the remaining channel is left unused. When taking this approach, be sure that the sub-woofer will be producing all bass notes from the head unit - not just the notes from the left or right output channel. To ensure this, we merged the left and right RCA outputs of our existing audio head unit into a single RCA lead. More on this later. As mentioned, the Lexus sub-woofer doesn't require a dedicated enclosure - it can be free-air mounted either in the rear parcel shelf (like in the SC400) or it can fire through an opening in the rear seat backrest. Our demo Mitsubishi Galant VR4 comes equipped with a ski-port that aligns with the fold-down rear armrest - we chose this position because it is ideally sized to fit the Lexus 10-inch sub-woofer and we are unlikely to ever use the ski-port. We had originally hoped to mount the amplifier beneath one of the Galant's front seats because it would remain cooler inside the (air conditioned) cabin. Unfortunately, there wasn't enough space to mount it there so we settled for a position alongside the sub-woofer inside the boot. With the sub-woofer location decided, the first step is to construct a sturdy mount for it. We made a mounting board from a sheet of 12mm MDF (medium density fibreboard), which we cut to fit along the backrest between the rear suspension towers. This replaces a flimsy factory trim panel. 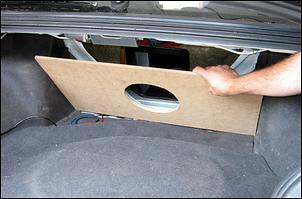 The MDF board was later bolted to metal braces across the Galant's backrest. The sub-woofer should be centred inside the ski-port opening so, to achieve this, we jumped in the back seat and traced the port opening through to the MDF board in the boot. 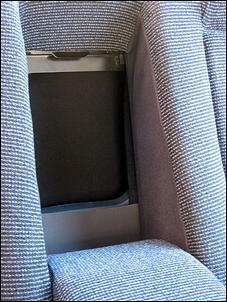 In the VR4's case, this meant first breaking off a plastic ski-port panel that flips down behind the centre armrest. 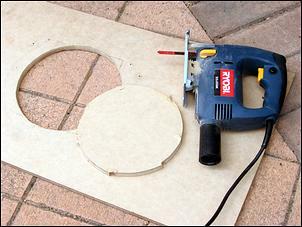 Next, remove the MDF board from the vehicle, locate the exact centre of your ski-port outline and use this as the centre to draw a 10-inch circle - this forms the outline for the sub-woofer cutout. We cut out the opening for the sub-woofer using an electric jigsaw and filed it smooth. Four screw holes - which are used to secure the speaker - were then drilled through the MDF board. As mentioned, we had decided to mount the amplifier alongside the sub-woofer inside the boot. Mounting the amp is very straightforward - we simply drilled four holes into the MDF board and screwed it into place. Be sure to mount the amp in a position that will allow you to access its crossover, bass boost and gain controls. 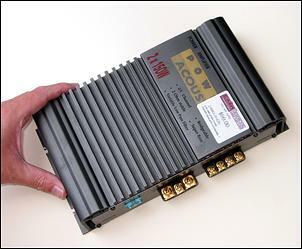 Like most amplifiers, the Power Acoustik model we used requires a 12-volt supply, an accessory input (used to switch the amp on/off), earth and a RCA input from the head unit. 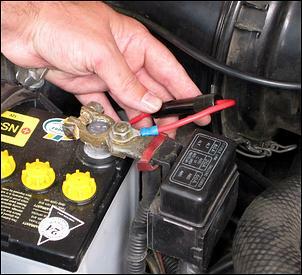 The 12-volt supply was sourced straight from the battery. Note that a fuse (a 15 amp fuse for this particular amplifier) should be mounted near the battery terminal. 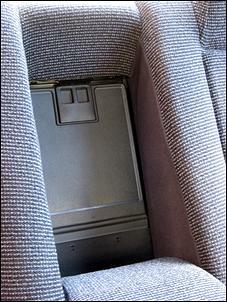 The 12-volt wire was then passed through an existing opening in the firewall, under the dash, under the centre console, across to the left sill, under the rear seat lower cushion and up into the boot. 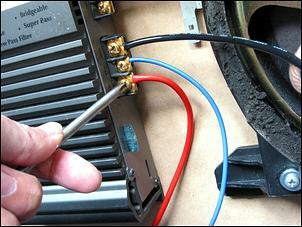 Make sure that this wire is well protected and that the firewall opening uses a rubber grommet. A suitable earth for our installation was found inside the boot near the amplifier. A 12mm bolt that joins two parts of the bodywork was removed revealing a bare, unpainted surface that was ideal for earthing purposes. We crimped an eye terminal onto the end of the earth wire and screwed the terminal against the bare bodywork. Easy. 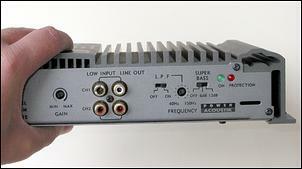 The amplifier's accessory input (for switching the amp on/off with the ignition key) was connected to the existing accessory input for the audio head unit. 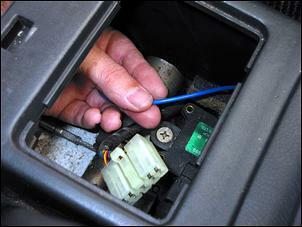 The accessory input wire was routed through the cabin identically to the 12-volt supply wire. Because we were only going to use one output channel of our amplifier, we had to get a bit creative with our RCA lead arrangement... A Jaycar 2-into-1 RCA line (Cat. WA-7054) was connected to the left and right RCA output terminals of our head unit, and a single 1.5-metre RCA line extension (Cat. WA-7050) was run through to Channel #1 of the amplifier. 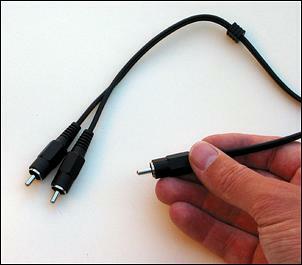 A socket (Cat PA-3598) was required to join both RCA leads together. This arrangement ensures the bass notes that would normally be fed separately into a left and right speakers are all fed into the single speaker. Nothing is lost except stereo imaging (which isn't much present in bass anyway). It's always important to use appropriate speaker wire. The rule of thumb in this area is 'bigger is better', so we went whole-hog using Jaycar's Jumbo speaker cable (Cat. WB-1732). One end of this wire was soldered to the sub-woofer terminals and the other was fastened into the screw-type terminals of the amplifier. The final cosmetic touches to our sub installation were to add carpet to the rear of the mounting board and some speaker cloth in front of the sub-woofer (which is visible from inside the cabin with the centre armrest folded down). The carpet we used to cover the rear of the mounting board was bought through a carpet/trim retailer we found in our local phone directory under the heading 'Motor Body Trimmers' Supplies'. The Galant VR4 comes with a dark grey boot carpet, which we managed to match closely with a large section of new carpet costing just AUD$11. 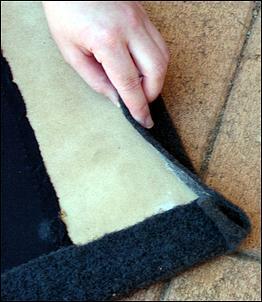 The carpet was cut to approximate size and glued to the MDF board using a commercially available spray-on contact adhesive. Make sure that you fold the carpet around the edges of the MDF board and glue them on the reverse side - this prevents the edges peeling off. 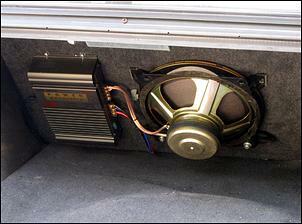 The cutout in the carpet to accommodate the sub-woofer was created with a razor blade. And now to the forward side of the MDF board... We purchased a 1.5 x 1.0-metre piece of speaker cloth from Jaycar (Cat. CF-2752), cut it to size and glued it directly onto the front of the MDF board. Note that - before gluing the speaker cloth to the board - we first sprayed some matt black paint on the MDF around the area of the sub-woofer. 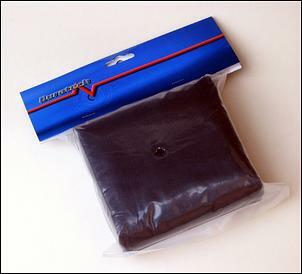 This eliminates the chance of anyone seeing bare wood through the speaker cloth. To enjoy optimum sound quality, ensure that the MDF board is thoroughly sealed against the rear backrest - the air in front of the sub-woofer cone must be kept completely separate to the air behind it. We sealed the front of our MDF board to the backrest with some adhesive foam strip, which compresses to form a nice seal when the board is secured to the bodywork. Now screw the sub-woofer and amplifier back into the board, reconnect the wiring, bolt the MDF board to the body and you're 99.9 percent done. Whack on a couple of cable ties to group the wires together and that's it! So how does the Lexus sub-woofer and AUD$90 amplifier sound in our Galant VR4? Well, very good - we were surprised at how good! The sensitivity of the Lexus sub-woofer must be extremely high, because we achieved a balanced overall sound with the amp gain turned down near minimum. The bass is not as punchy as many other sub-woofer systems we've listened to, but to our ears it is very capable of pushing out those really low frequencies. The ones that vibrate the interior mirror. Interestingly, our sub/amp arrangement can be optimised to different styles of music by configuring the Loud function and bass adjustment on the head unit, along with the adjustable bass boost and crossover built into the amp. We found a happy middle ground by leaving the sub crossover at around 120Hz, zero bass boost on the amp, but with the head unit set on Loud and +2 Bass (from a maximum of +6). Oddly enough, the sub-woofer sounds barely any different with the centre rear arrest folded up or down - there's only a slight variation in bass volume. Considering the money spent, the minimal amount of boot space sacrificed and small weight gain, we couldn't be happier with the result! 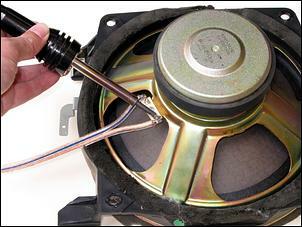 Not including incidentals such as spray-on contact adhesive, screws, a fuse, etc.